Shrouded in mystery and the infinite spell of charisma and charm of nature, the vast paddy fields and dotting monasteries, ancients Dzongs, and unique traditions, Bhutan is dream come true for the travelers across the world. Authorizing only two modes of accessibility in its domain, one by air, other by road, due to its landlocked position, Bhutan evokes the sense of intrigue and spirituality. Blessed with varied landscapes, mostly highlands, and steeps, Bhutan treasures destinations where not a foot has trodden since the inception. I have considered an extended vacation in Bhutan; then grab the opportunity to explore the nook and corners that comprises top 10 offbeat places in Bhutan with the unbeatable car rental in Jaigaon. Abode to Torsha Strict Nature Reserve- one of the protected enviro-friendly regions, Haa region is one of the sparsely populated regions in Bhutan. The major attraction of Haa Region is Haa Valley, which is known for its steep fall and mesmerizing tenor. Opt for car rental in Bhutan to discover the best of Haa region. Known as Tiger’s Nest, Paro Taktsang is known for its mysterious cliffside location, which evokes awe and wonder. Located at an elevation of 973 feet, Paro Taktsang is one of the most coveted destinations in Bhutan. There are no roads suitable for driving uphill to the Tiger’s Nest. However, you can opt for car hire in Bhutan that can transfer you to the base, from which you can trek uphill to the monastery. A valley beautifully formed in U-shape, Phobjika Valley is an ideal destination for the nature lovers. Phobjika valley has a plethora of wildlife, and exploring the region during winters will bring you the opportunity to spot the black-necked cranes. You can book car rental services in Bhutan to reach Phobjika Valley. Besides, you can trek by yourself to reach the valley. Still embracing the traditional methods of agriculture and rice growing techniques, Punakha Ritsha Village is known for its extensive paddy fields and traditional architectural styled houses. Each house in Ritsha Village has an orchard and rice field. Engulfed by the serenity, a visit to the village will simply make you forget the world. Located in the fertile and scenic Lobesa Village in Punakha, Chimi Lhakhang is dedicated to the divine madman Drukpa Kuenley. This temple is blessed by the divine madman is also called the Temple of fertility, as many childless couples have been able to bear the children after visiting here. You can avail car hire in Bhutan to reach Lobesa Village and take 25 minutes walk uphill to reach Chimi Lhakhang. Build closely associated with a cliff, the construction of Kila Nunnery has been traced back to 9th century for the purpose of meditation. Its major appeal is its unique architectural style and the serene ambiance. You can avail car rental in Bhutan in order to enhance your trip to Kila Nunnery and combining it with a scenic drive starting from Chele La Pass via woods, streams, prayer flags. Lhuentse is the most isolated part of Bhutan, located on the farthest northeast corner of Bhutan with jaw-dropping landscapes and backdrops, luxuriant forest, rugged terrains, and lofty peaks. Initially the abode to the royal family, Lhuentse is not much exposed as a tourist destination due to the lack of development in infrastructure. However, you can explore this fascinating region availing car hire in Bhutan. Settled on a hillside near the Gamri Chu River, Trashigang fascinates the travelers with its lavender fields, vast and beautiful paddy fields and creates an intersection between Samdrup Jongkhar and Assam, the state in India. A long 17-hour journey from Thimphu makes this region a less visited and one of the Offbeat places in Bhutan. 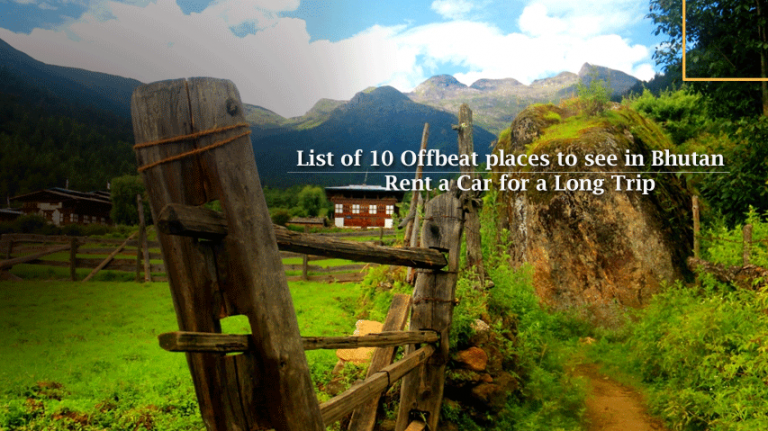 Access the untouched beauty with instant car rental services in Bhutan. One of the lowest lying regions in Bhutan, Samtse district of Bhutan has diverse and different geographical and cultural traits different from the rest of the country. The culture and traditions of Samtse District lean largely towards Hinduism due to the influence of the Nepalese population. Located between the roads to Trashigang and Thimphu, this small district is the abode to Bhutan’s newest Dzongs. Constructed as early as the 1930s, these Dzongs are built in the traditional method without using drawings and nails. The awe-inspiring architectural designs are further enhanced by the surrounding scenic charm. You can opt for car hire in Bhutan for exploring beyond what has been said here. So, don’t think more! Pack your bags and prepare to uncover the hidden offbeat destinations in Bhutan.